AmazonSmile allows shoppers to enjoy the same wide selection of products, low prices, and convenient shopping features as on Amazon.com. When customers shop on AmazonSmile, the AmazonSmile Foundation will donate 0.5% of the price of eligible purchases to the charitable organizations selected by customers. Organizations must be registered and in good standing with the IRS as a 501(c)(3) to be eligible to participate. 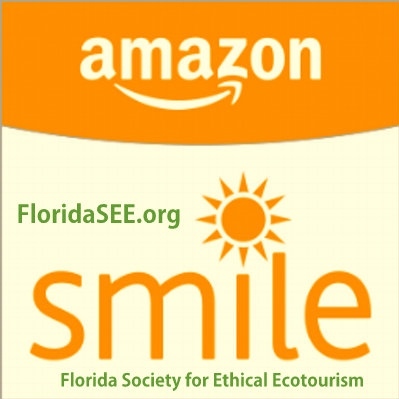 As a 501(c)(3) organization, The Florida Society for Ethical Ecotourism has joined AmazonSmile. When you shop on Amazon using our link, you will be helping to fund Florida SEE's mission of promoting authentic, ethical ecotourism practices in the state of Florida. Florida SEE wishes you a wonderful holiday season, and hopes you'll remember us when you shop on Amazon.